Petunia is a very special dog who won the hearts of many volunteers when she was rescued last year. The poor dog had been seen fending for herself for 8 months at the Wayland town transfer station, but was too skittish to let anyone close enough to her to catch her. Shirley Moore, dog rescuer extraordinaire and founder of local rescue group Save a Dog, stepped in and quickly captured her in a humane trap. So quickly in fact, that she had no place to keep her and contacted our shelter to see if we could take her in. 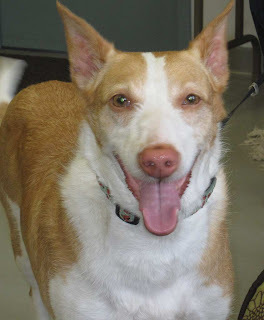 We fell for this gentle, sweet, adorable dog and were very sad when she turned out to be heartworm positive. We treated Petunia for heartworm and found her the perfect home to finish her recovery (she was supposed to stay very quiet with very limited activity for a month), only to have Petunia bolt out the door the first chance she got. After initial sighting the first day she was out, weeks went by with no sign of her. When she finally came back for food weeks later, it was clear her leg was badly injured. One of our volunteers set up an enclosure and spent many days patiently waiting for her to show up for food before finally capturing her. Almost a month after escaping from her house, she was once again safe. She needed extensive orthopedic surgery to repair her badly broken leg, which was likely the result of her being hit by a car. A year later Petunia is a happy, beautiful, loving dog who is devoted to her owner. Petunia stopped by recently for a visit and we were amazed by how great she looks. She is a survivor!